This section contains downloadable versions of previously published works on or about Filipinos in Hawaii that are either out of print or difficult to locate. The Filipinos in Hawaii: An Annotated Bibliography is an annotated bibliography of published and unpublished research collected and annotated by Ruben R. Alcantara (with Nancy S. Alconcel, John Berger and Cesar Wycoco). Published in 1977, this volume is the sixth in a "Hawaii Series" of annotated bibliographies published by the Social Sciences and Linguistic Institute of the University of Hawaii (subsequently merged into the University of Hawaii Social Science Research Institute) and were "devoted to the tracing, compilation and evaluation of the existing literature on the various peoples and cultures" of Hawaii. Copy used for digitizing courtesy of Operation Manong, University of Hawaii at Manoa (aka Office of Multicultural Student Services). Cite as: Alcantara, Ruben R. The Filipinos in Hawaii: An Annotated Bibliography. Social Sciences and Linguistics Institute, Hawaii Series No. 6. Honolulu, Hawaii: University of Hawaii, 1977. http://efilarchives.org/publications (accessed [date downloaded]). 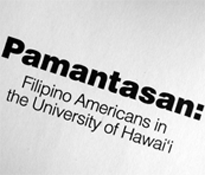 Click [here] to view or download The Filipinos in Hawaii: An Annotated Bibliography (152 pages, 18MB). 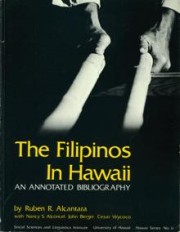 Sakada: Filipino Adaptation in Hawaii is a 1981 publication of research conducted by Ruben R. Alcantara of Filipino plantation workers in Hawaii. Included are historical and sociological overviews of Filipino plantation workers and Alcantara's own descriptions and analysis of their family lives and community relations. Original publication and permission to publish online was granted by the University Press of America (Washington, D.C.). Copy used for digitizing courtesy of Operation Manong, University of Hawaii at Manoa (aka Office of Multicultural Student Services). Cite as: Alcantara, Ruben R. Sakada: Filipino Adaptation in Hawaii. Washington, D.C.: University Press of American, 1981. http://efilarchives.org/publications (accessed [date downloaded]). Click [here] to view or download Sakada: Filipino Adaptation in Hawaii (190 pages, 26MB). 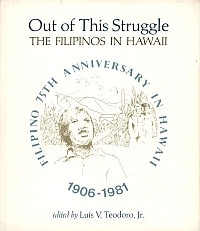 Out of This Struggle: The Filipinos in Hawaii is a 1981 publication of the Education (Printed) Committee of the Filipino 75th Anniversary Commemoration Commission. This Commission was created by the 1977 Hawaii State Legislature, through Enabling Act 181, to oversee the 75th anniversary of Filipino immigration to Hawaii. Various authors contributed to the writing of the text, but their contributions to specific chapters are not identified. Luis V. Teodoro, Jr. served as overall editor for the publication, with foreward by Danilo E/ Ponce, M.D. and drawings by Francisco "Corky" Trinidad. Publication was by the University Press of Hawaii with funding, in part, through a special appropriation by the Hawaii State Legislature. A photograph section appears without pagination between chapters 4 and 5. It is included in a separate file below. Cite as: Teodoro, Luis V., editor. Out of This Stuggle: The Filipinos in Hawaii. Honolulu, HI: University Press of Hawaii, 1981. http://efilarchives.org/publications (accessed [date downloaded]). Click [here] to view or download Out of This Struggle text (97 pages, 16MB). Click [here] to view or download Out of This Struggle photos (24 pages, 38MB). 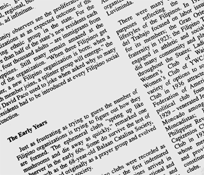 A supplemental pamphlet, The Filipinos in Hawaii: the First 75 Years, was also published in 1981 by the Hawaii Filipino News [go to pamphlet section]. Ti Biag Idiay Kampo Siete: Istoria Iti Maysa A Kamaan A Pilipino Idiay Waimanalo, Haway (Life In Camp Seven: The Story Of A Filipino Family in Waimanalo, Hawaii) is a 1974 publication of the General Assistance Center for the Pacific, College of Education, University of Hawaii. Documentary of the Rosete family (Antonia, Bonifacio and Conchita) as told and illustrated by Mary Ann Lynch. Ilokano text by Prescilla L. Espiritu and Tagalog text by Belen C. Ongteco. Consultation by Esperanza G. Labez and Nancy Foon Young. Original funding by Office of Education Grant Number OEC-9-73-0151. Cite as: Lynch, Mary Ann. Ti Biag Idiay Kampo Siete (Life in Camp Seven). Honolulu, HI: General Assistance Center for the Pacific, College of Education, University of Hawaii, 1974. http://efilarchives.org/publications (accessed [date downloaded]). Click [here] to view or download Ti Biag Idiay Kampo Siete (42 pages, 32MB). Ating Tao: Our People (The Filipinos in Hawaii) is a 1976 publication of the General Assistance Center for the Pacific, College of Education (Educational Foundations), University of Hawaii. Edited by Bernadette Suguitan Ledesma. photographs by Robin Lee (unless otherwise noted), illustrations courtesy of Corky Trinidad, and typographical assistance by Lani Wright. Funded by Office of Education Grant Number C391-75-0006. Cite as: Ledesma, Bernadette Suguitan, ed. Ating Tao: Our People (The Filipinos in Hawaii). Honolulu, HI: General Assistance Center for the Pacific, College of Education, University of Hawaii, 1976. http://efilarchives.org/publications (accessed [date downloaded]). Click [here] to view or download Ating Tao: Our People (121 pages, 29MB).